Today I was ‘terminated’ from YouTube with no real explanation of why. I've followed the proper channels to ask for reconsideration and have written this open letter to YouTube. It was way back in 2006 I believe when we first met. I uploaded a video I made (at the time with my ageing digital camera) to show a magic trick. To my surprise it gained a few thousand views so I decided to create a YouTube channel and make more videos teaching magic tricks, I was having a blast. A couple of years passed and you offered to take our relationship up a notch. You wanted to partner with little old me and place adverts on my videos so we could both make a bit of pocket money. WOW win, win - I was super stoked you obviously liked my content - I thought we could go far. But today it's all over in a blink of an eye. It seems you were not happy with three of my videos which has led to this break up. Other than a mention of breaking your "YouTube's Community Guidelines" I still don't know exactly what I've done wrong - otherwise I would have certainly fixed it. The straw that broke the camel's back seems to be one of my older YouTube videos "Spoon Melt Magic Trick" below. Other than the poor taste in music (royalty free music I might add). I'm really not sure why this video has broken "YouTube's Community Guidelines". And if I knew why I could fix or remove it myself. YouTube I understand you have to have policies to deal with spammers/scammers - but I've always tired to play by the rules, when I know what they are. Come on!!!! You tube.... we love Simon!!!! he's a good guy and he make us have some great fun...!! we don´t want Simon leave us!!! what is wrong with this video? c'mon, give us Simon back you tube team. dear simon. it s arash. I watched your tricks and read them too. and i really enjoy them. thank you for all of them. Simon does help us by sharing his talent. He is my instructor of magic. I have learnt a lot of things from his. So youtube should unblock his chanel.. 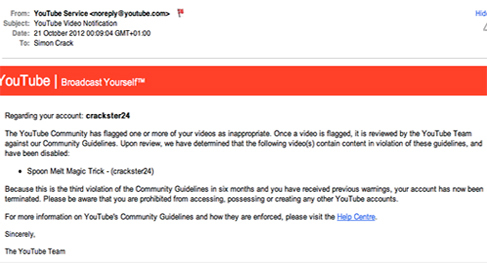 I was thinking of registering a account, YouTube, but since the videos Ilike the most is banned, I won't bother! Please bring back this Chanel it is one of my favorites! This man provided a public service for free. I don't understand why broken his channel? YouTube should at least explain the reason and if there is one, give a chance to fix the problem! Hope to get this channel back soon! Dear youtube please have a heart and give simon his channel back and let him back on there. I like so much your videos, it is a pity that YouTube switch off your channel. I hope that they will re-consider. Please bring back Simon's videos because they help us to understand magic. I was really shocked!! It is unfair on your part UT. Please put him back on the track. I enjoy his tricks and learn to show to my friends. Just what did he do? It's like people who write nasty letters and won't own up to it! Just chicken. I see nothing which contravenes the rules. Don't know what the fuss is about I'd let a 5 year old watch this site. never seen anything to offend or break any sensible rules. That's a shame. Youtube need to pay attention here. Very disappointed Simon's videos have been banned. they are a very useful resource for beginners and others, I hope they are reinstated very soon. I like the letter. Like how it's been a blast and how fast they went. I hope they let you back. I really liked your videos. Bring him back, please! All he has ever done is entertain...and done well and with fun..YouTube should be pleased with members like this! Simon has been more than generous sharing for free tricks that could be making him $$$$. Sure hope this can be cleared up! Why ban an innocent guy? I have always enjoyed Simon's videos. I find nothing offensive or distasteful. Please reinstate them. COME ON U-TUBE GIVE THE GUY A FAIR-GO. AT LEAST LET HIM KNOW WHAT THE PROBLEM WAS SO HE CAN AT LEAST APOLOGISE TO YOU, IF NOT CORRECT IT. I like Simon's videos. I request YouTube to reactivate Simon's account. IN THIS VIDEO I see nothing that can be rejected, to me that there is error in YOUTUBE, may realize and solve it. Give explanation or the account. This can only be a mistake. YouTube, please correct it. An explanation of the why and wherefore here is required in order to correct any unknown error. Please advise Simon at once thank you. At the very least tell him what he did wrong so he can fix it, terminating this way is wrong. I enjoyed your channel. Hope I will see you soon! Explain yourself (which is your right) or return what has been a source of enjoyment to your subscribers. Hope you will restore Simon to us!!!! It looked ok to me. Let him back in u-tube or explain! This guy is on the level, a lot of fun and righteous. Please review his case and give him justice. A concerned Parent!